Rather than try to avoid surprise, leaders can see their work as a form of craft that invites surprise, embraces uncertainty and instructs us in how to be open to and learn from the unexpected and to engage a larger unknown. 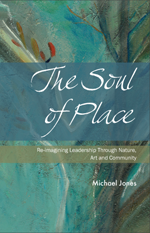 Michael Jones is an evocative speaker, storyteller, writer, pianist/composer and catalyst for community and organizational engagement and change. He recognizes that to engage the soul of place we need to reawaken the soul through collaborative processes that build capacity for adaptability, self-awareness, reflective practices, deep empathy, comfort with ambiguity, and the courage to imagine and act upon creative possibilities. Michael’s work has been supported by the Fetzer Institute, The MIT Dialogue Project, The international Leadership Association, The James MacGregor Burns Academy of Leadership, Tamrack Institute for Community Engagement, The Executive Education Programs at the Center for Leadership and Transformation University of Texas, San Antonio and many others. Every voice matters. In this time of expansion, we need many eyes on the world to create the future we want. The enchantment of nature, the beauty of art, and the gathering together in community serve as the three braids of place, the weave of which can form an unbreakable bond that will bring and hold the world together. Dialogues for a New Partnership involves bringing together First Nation, Métis and non-First Nation Leaders to re-imagine a new narrative for the future rooted in our stories and shared sense of place and place–making together. This year’s Dialogues for a New Partnership will be the fourth in a series of forums on the soul of place and creative place making. These forums have been supported by the Banff Centre for Leadership Development, The Tamarack Institute for Community Engagement, The Breuninger Foundation and Muskoka Chautauqua. Too often our places remain placeless because they don’t include our stories. Stories of place create a platform for creative tourism and building a destination economy through recognizing that visitors seek an interaction with a place through authentic experiences that inspire and inform. Michael has worked with communities and organizations to re-imagine their future through connecting with the rich legacy from their past. Even tomato plants and the tallest trees send down roots as they rise towards the light. Yet the metaphors for our lives see mainly the upward part of organic motion. The Solarium is a creative space – an incubator – where leaders become stewards of the roots and soil through facilitating generative inquiry and transformative conversations. Through 2016 and 2017 Michael and his colleagues will be convening local Solariums through community workshops and conversations in order to develop capacities for regenerating local living place-based economies.